The importance of thermal spraying has risen significantly especially in the past 20 years, because of increasing demands on components. Thermal Spray Coating involves melting or heating of powder or wire feedstock using special torches, accelerating the particles towards the part to be coated where they impact and cool to form a coating. 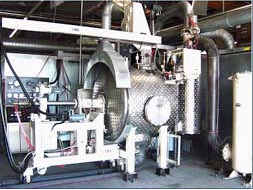 Thermal spray processes have gained acceptance and are widely used in different industrial branches. The importance of thermal spraying has risen significantly especially in the past 20 years, because of increasing demands on components. The combination of structural and surface demands e.g., outstanding strength combined with high corrosion or wear resistance) can often only be met economically by applying coatings. Thermally sprayed wear and/or corrosion protective coatings as well as thermal barrier coatings are examples of this strategy. Additionally, thermal spraying is applied to repair parts. In the standard DIN EN 657, thermal spraying is defined as a process, in which the feedstock is partially or fully melted inside or outside a spraying gun and deposited on a prepared surface. However, in general, there is a weak bond strength between the substrate and the coating; the coatings contain pores. Post treatment (e.g., by remelting) hot isostatic pressing (HIP) or shot peening helps to improve the bond strength and/or decrease the coating porosity. Usually, exact coating thickness is achieved by grinding, which also provide a low surface roughness. Thermal Spray Coating involves melting or heating of powder or wire feedstock using special torches, accelerating the particles towards the part to be coated where they impact and cool to form a coating. Generally any material without a sublimation point can be deposited using this technique. Thermal spray can be used to apply high performance surfaces to resist wear, corrosion or heat damage. Thermal Spray Coating can also be applied for special applications such as electrical insulation or conduction, x-ray emission and thermal emission. A common application is build up and repair of worn components. The High Velocity Oxygen Fuel Coating Process (HVOF) is considered the most advanced method of applying hard tungsten or chromium carbide coatings by thermal spray. Fine powders of these material is deposited at supersonic speeds onto the part being coated, forming exceptionally dense adherent deposits. Typical coating ranges are .003-.015” thick. Coatings can be ground to mirror finishes using diamond wheels or left unfinished to serve as gripping surfaces. Other hard facing material such as Stellites, Triballoys and bronzes may also be deposited using this technique. Corrosion resistant materials such as 316 or Hastelloy are also deposited routinely. Below are given some technical information on HVOF applied Tungsten carbide-86:10:4% Cobalt Chrome coating. Surface Modification Systems Inc. (SMS) a leader in the development of high technology coatings for industry is one of the few job shops in the world with a low pressure plasma spray (LPPS) system. LPPS allows formation of extremely dense overlays with metallurgical bonding. Coating thicknesses can vary from .005”-.1”. Overlays can include Stellites, carbides, ceramics, nickel and iron based hard facings. 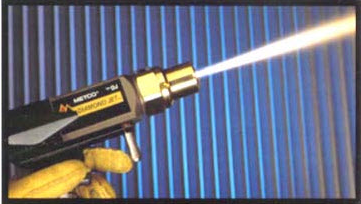 This technology is applicable where HVOF and conventional plasma or flame spraying techniques are inadequate. Testing has revealed that the wear, corrosion and oxidation resistance of these coatings are superior to that of other types of thermal spray. LPPS can be used to solve wear, corrosion and high temperature problems in the valve, pump, medical and aerospace industries.